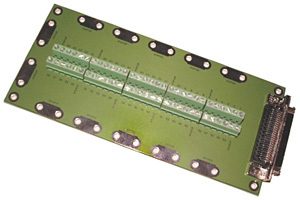 The TERM50 is an interconnection board that eases connection to high I/O count peripheral boards. Its primary intention is to support I/O connection to the MPL PIP series of industrial PC products. Typically PC/104 peripheral boards present their I/O's on two standard raw 0.1 in pin headers up to a total pin count of 50. MPL AG brings these I/O signals to a mini Dsub connector on the PIP front through an adapter cable. The TERM50 allows the translation from mini Dsub to individual screw terminals and presents additional screw terminals for shield connections.